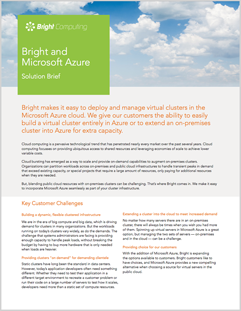 A private cloud offers many of the same benefits that a public cloud does, such as flexibility and scalability, but does it using private IT infrastructure. 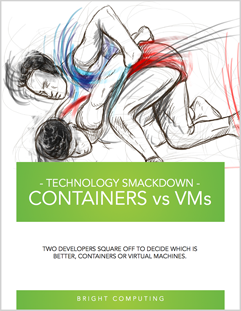 While public clouds provide services to many different companies, a private cloud is used by only one. 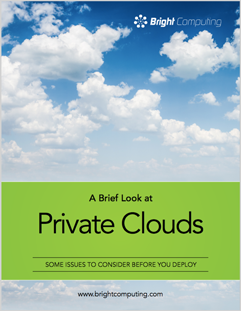 This eBook provides a brief look at private clouds and discusses some issues to consider before you deploy. CHPC embarked on a multi-year project to upgrade its entire HPC environment. Their existing estate, comprising four HPC clusters with a combined compute power of approximately 114 Teraflops, were to be enhanced with the edition of a new peta-scale supercomputer. 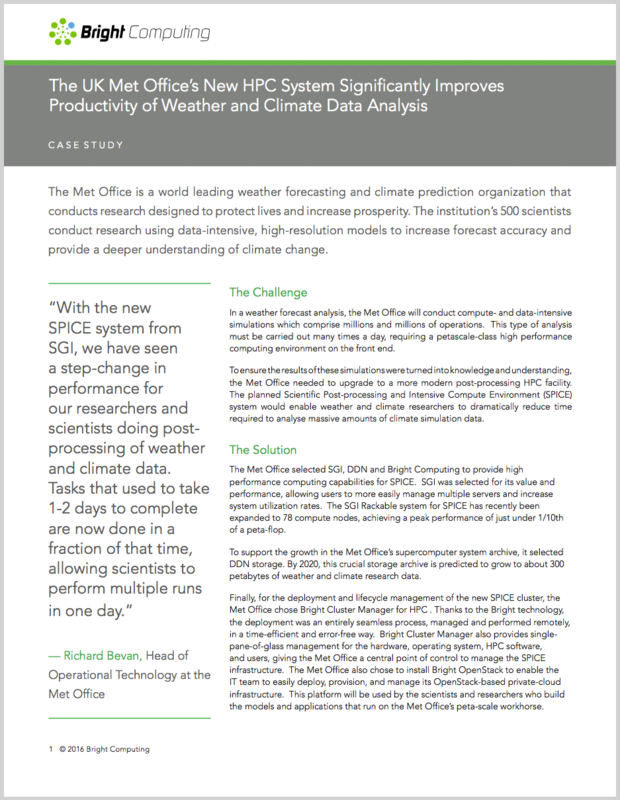 The Met Office is a world leading weather forecasting and climate prediction organization that conducts research designed to protect lives and increase prosperity. The institution’s 500 scientists conduct research using data-intensive, high-resolution models to increase forecast accuracy and provide a deeper understanding of climate change. The largest use of Univerity of Leicester's HPC service comes from the Science and Engineering departments, but there is significant use in other areas such as Economics, Health Sciences, Genetics, and Cardiovascular Science. 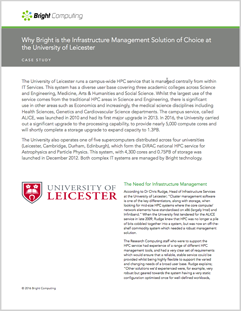 Learn why the university selected Bright to manage its campus-wide HPC service. 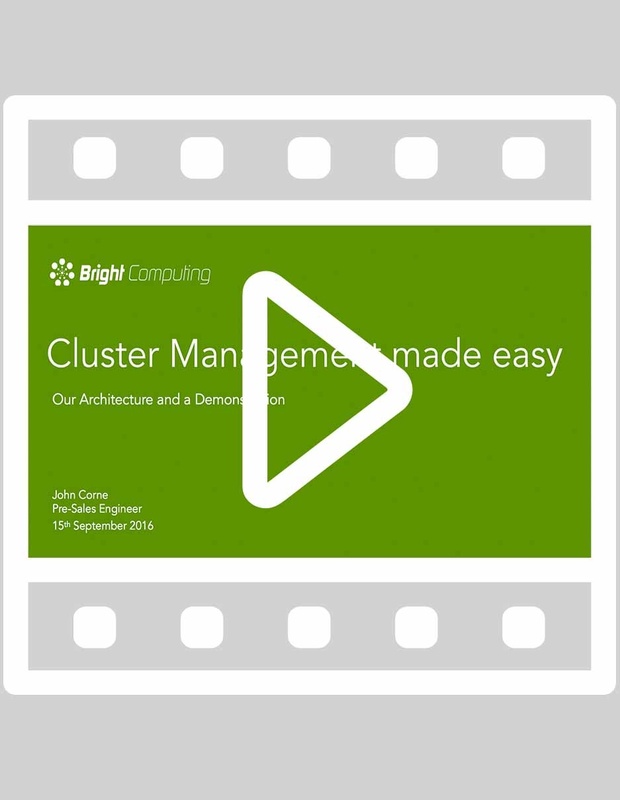 This European electronics company has been a long-term user of Bright Cluster Manager, having started with a modest 4 node HPC cluster back in 2013. 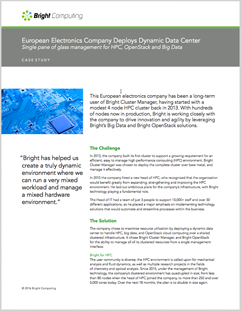 With hundreds of nodes now in production, Bright is working closely with the company to drive innovation and agility by leveraging Bright’s Big Data and Bright OpenStack solutions. 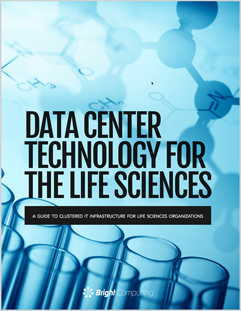 In this book, we look at some of the drivers that are causing many life science organizations to upgrade their clustered IT infrastructure. This webinar offers insight into OpenStack IaaS (Infrastructure as a Service) to design a private cloud solution, from a brief introduction to OpenStack to a focus on the essentials of Bright OpenStack, exploring the possibilities offered by this architecture.